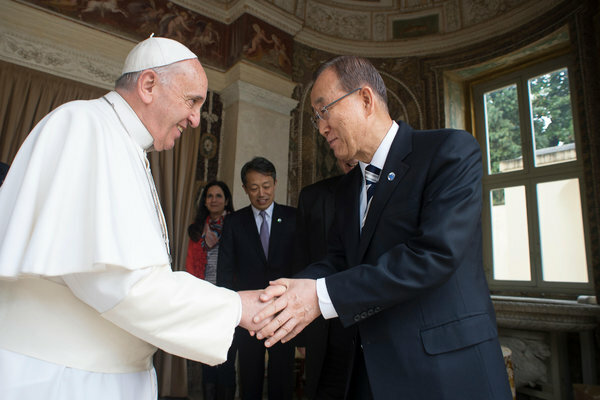 VATICAN CITY — Ban Ki-moon arrived at the Vatican with his own college of cardinals. Mr. Ban, the United Nations secretary general, had brought the leaders of all his major agencies to see Pope Francis, a show of organizational muscle and respect for a meeting between two global institutions that had sometimes shared a bumpy past but now had a mutual interest. The agenda was poverty, and Francis inveighed against the “economy of exclusion” as he addressed Mr. Ban’s delegation at the Apostolic Palace. But in an informal meeting with Mr. Ban and his advisers, Francis shifted the discussion to the environment and how environmental degradation weighed heaviest on the poor. On Thursday, Francis will release his first major teaching letter, known as an encyclical, on the theme of the environment and the poor. Given the pope’s widespread popularity, and his penchant for speaking out on major global issues, the encyclical is being treated as a milestone that could place the Roman Catholic Church at the forefront of a new coalition of religion and science. Francis, the first pope from the developing world, clearly wants the document to have an impact: Its release comes during a year with three major international policy meetings, most notably a United Nations climate change conference in Paris in December. This month, the Vatican sent notifications to bishops around the world with instructions for spreading the pope’s environmental message to the more than one billion Catholics worldwide. By wading into the environment debate, Francis is seeking to redefine a secular topic, one usually framed by scientific data, using theology and faith. And based on Francis’ prior comments, and those of influential cardinals, the encyclical is also likely to include an economic critique of how global capitalism, while helping lift millions out of poverty, has also exploited nature and created vast inequities. “We clearly need a fundamental change of course, to protect the earth and its people — which in turn will allow us to dignify humanity,” Cardinal Peter Turkson of Ghana, who oversaw the drafting of the encyclical, said at a conference on climate change this spring at the Vatican. “The Vatican and the pope should be arguing that fossil fuels are the moral choice for the developing world,” said Marc Morano, who runs the website Climate Depot and once worked as an aide to Senator James M. Inhofe, an Oklahoma Republican and climate change skeptic. The first clue of the pope’s interest in the environment came when he chose his name in honor of St. Francis of Assisi, the 13th century friar who dedicated himself to the poor and is considered the patron saint of animals and the environment. Francis had shown interest from his days in Argentina, when he was Cardinal Jorge Mario Bergoglio, the archbishop of Buenos Aires. There, he played a major role in convening different leaders to seek solutions for Argentina’s social ills. Francesca Ambrogetti, who co-wrote a biography of Francis, said he pushed for scientists at the Pontifical Catholic University of Argentina to investigate the impact of environmental issues on humanity. As far back as September 2004, Cardinal Bergoglio cited the “destruction of the environment” as contributing to inequality and the need for social reforms. At a 2007 meeting of Latin American bishops in Aparecida, Brazil, he oversaw the drafting of a broad mission statement that included an emphasis on the environment. Pablo Canziani, an atmospheric physicist who researches climate change, said Francis, who had once trained as a chemist, became very interested in the links between environmental destruction and social ills, including a dispute over paper pulp mills on the border with Uruguay, which Argentina claimed were polluting local drinking water. The pope, Professor Canziani added, has stayed in touch. Last year, the Vatican invited professors at his university to contribute ideas for the encyclical. He said they sent a memo focused on legal issues, sustainability, civic responsibility and governance. The final document seems certain to bear the fingerprints of scientists and theologians from around the world. The Rev. Sean McDonagh, an Irish priest who has worked on environmental issues and climate change for decades, said that Cardinal Turkson contacted him more than a year ago and asked if he would write a comprehensive document about the theological and ethical aspects of environmental issues. Father McDonagh said he had spent two or three months writing about climate change, biodiversity, oceans, sustainable food “and a section at the end on hope.” Then he sent it to the Vatican. “At the time, they didn’t say there would be an encyclical,” he recalled, adding that he was eager to see it. The hoopla over Francis’ encyclical confounds some Vatican experts, who note that both of Francis’ predecessors, Pope John Paul II and Pope Benedict XVI, wrote about the role of industrial pollution in destroying the environment. Benedict was called the “green pope” after he initiated projects to make the Vatican carbon-neutral. Other religious groups, including evangelical Christians, have spoken about the impact of environmental destruction on the poor. But many analysts argue that Francis has a singular status, partly because of his global popularity. And in placing the issue at the center of an encyclical, especially at a moment when sustainable development is atop the international agenda, Francis is placing the Catholic Church — and the morality of economic development — at the center of the debate. In January, while traveling to the Philippines, Francis told reporters accompanying him that he was convinced that global warming was “mostly” a human-made phenomenon. Francis will travel in July to South America, and in September to Cuba and the United States, where he will speak about his encyclical at the United Nations. Ms. Clark and other development officials can tick off myriad ways that the global poor bear the brunt of environmental damage and changing weather patterns, whether they are African farmers whose crops are destroyed by drought or South Asian farmers threatened by rising sea levels. In this context, Vatican officials say, Francis is likely to see moral injustice. The May 2014 meeting at the Vatican between Francis and the United Nations delegation came at a propitious moment. The Vatican had just held a major symposium that brought together scientists, theologians, economists and others to discuss climate change and the social impact of environmental damage. Partha Dasgupta, a member of the Pontifical Academy of Sciences who helped organize the symposium, said many scientists — having dedicated their careers to raising awareness and trying to influence policy — were perplexed at the seeming lack of broad political response. Mr. Dasgupta, an agnostic, said he hoped that Francis could capture public attention by speaking in the language of faith. Jonathan Gilbert contributed reporting from Buenos Aires, Gaia Pianigiani from Vatican City, and Laurie Goodstein from New York. A version of this article appears in print on June 14, 2015, on page A1 of the New York edition with the headline: Pope to Explore Climate’s Effect on World’s Poor.